Rummaging through my supply of veggies the other day, I came across an abundance of Rutabaga. All winter we have been snacking on raw rutabaga, and mashing it to have with Christmas Dinner and Sunday Night Suppers. Not knowing what else to do with them, as I have no imagination when it comes to rutabaga, I decided to take them to work and share with my colleagues a few organic veggies. I packed up a cabbage, onion and rutabaga and off to work I went. Rina and Kuljeet were so excited for their little gifts. I did not however expect to discover a new recipe. A week later, Kuljeet, who sits close by my desk, brought to me a sampling of her Indian cuisine. She had prepared a tiny Indian buffet just for me. Among the dishes, was the rutabaga in a spicy concoction and the flavours were amazing. I was so surprised and thrilled that she took my rutabaga and turned it into such a work of art for the taste buds. Melt butter or oil in large skillet or wok over medium high heat. Toss in diced vegetables. Stir to mix and cover with a lid. Cook until just fork tender, 10 to 15 minutes, stirring often. Cubes will brown a bit. Once almost cooked, pour in lemon juice and spices. Toss well to distribute spices. Cover and cook for 5 minutes on low. Serve. This recipe is very versatile, and can be changed in a number of ways. This side dish could have diced steamed carrots and peas added in the end. This recipe works will with cabbage or cauliflower, and Kuljeet even used our watermelon radish and turned it into a masterpiece of flavour. 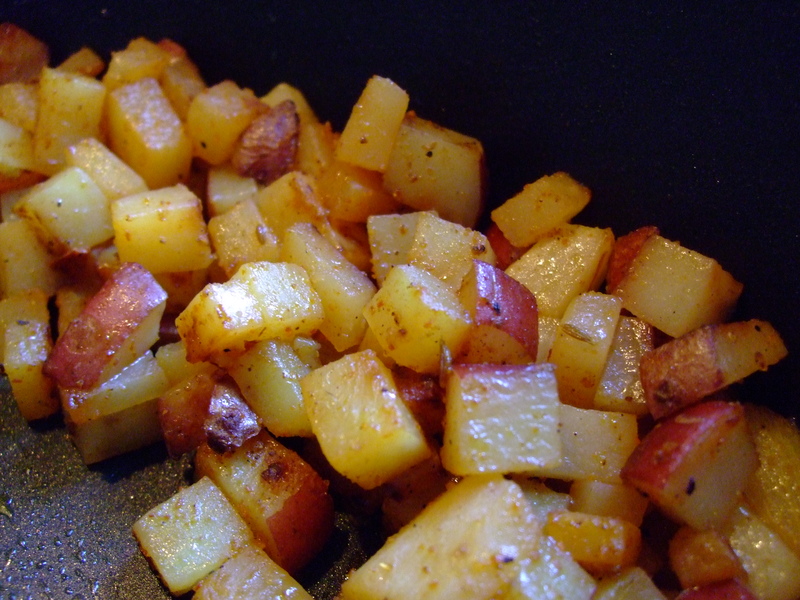 I suggest making this as a “hash brown” recipe for breakfast with Mervin’s Farm Fresh Eggs and Ira’s Fresh or Smoked Sausage or bacon. This is the most aromatic and fragrant of all Indian spice blends. Used throughout North India in all types of dishes — from appetizers and soups to yogurt salad and main courses — this blend is widely available, but the homemade version is more fragrant and, of course, fresher. There are dozens of other spices you can add to your original recipe: fenugreek, curry leaves etc. But if you start with the most important ones: black pepper, cumin, and coriander–you won’t go wrong. When making your own actual curry, always start with the ROUX–Use butter or ghee, large quantities of grated ginger root and garlic and pureed onion, or diced apple. Cook and stir until the mixture turns light caramel color, and then add your other ingredients like meat, veggies, and spice mix. Start off with a teaspoon or two of your fresh powder in your curry roux mixture and ENJOY! Don’t be stingy with your powder—it takes a lot of spices to make a good curry! Just take it easy to start and work your way up in the spicy heat department. Cook only until the mixture tastes meld. You cannot make an authentic curry without starting from a roux. Just throwing in curry powder does not a curry make. Lastly—if you go through all this trouble—why not package your homemade curry powder and give it as a gift to other foodies you know and love? Makes a wonderful custom-made present! This entry was posted in Uncategorized and tagged Cabbage, Potatoes, Rutabaga, Spicy, Turnip. Bookmark the permalink.